I found this pattern at Annie's Attic and thought it would be a good container for the placemats and potluck carrier for my SIL for Christmas. It is called Aruba Storage Basket. I love the color and it only took 1 day to make. 2 strands of WW cotton and an I hook. Love that bag, Mary Jo! Very nice basket. I love those colors. Pretty--I like the color and shape! It's a lovely basket, love the colors!! Looks like a really nice basket. Love the color. That basket is really nice! . Your SIL will love it:). Is that round or oval shape?. It looks oval to me but I can't be sure. Actually it is round, but it takes on the shape of whatever you put inside. That is the beauty of crochet baskets. They are always trying to accommodate our "needs" LOL. Wow. I love that! You did a great job! Thank you all. It was so much fun and easy to do. I love the color and it is going to be so hard to give it up. I done that with my Little Panda:). I do not keep anything for my self, I give everything away. BUT, after I finished my Panda I just had to keep him!!. Now I kept one of those Easter Bunny for my self. And I don't feel guilty about that! . PS: I forgot to ask, what is a potluck?. Oh it's beauuuuutiful! 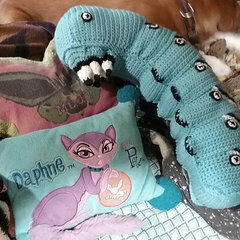 She is going to love it! You think up such lovely gifts for people. I'm sure they never forget the special things you make for them. I can guarantee your thoughtfulness is not forgotten. Thank you. I now have all her gifts done. 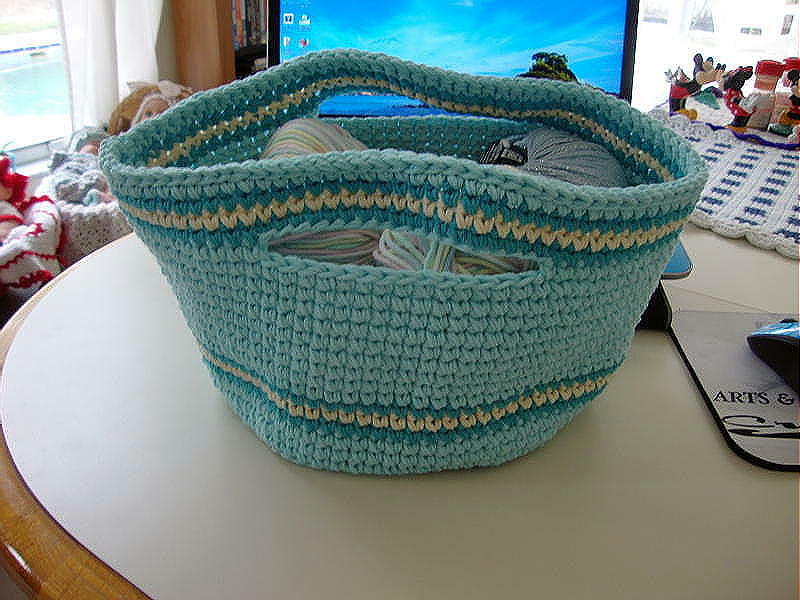 The basket looks perfect and so do the colors! I love baskets and yours is beautiful.